When I was a kid, I fell constantly. As an athletic boy, I was ALWAYS the messiest boy out there. Whether making a sliding tackle or sliding into second base, I was repeatedly getting dirty. The tops of my knees are permanently scarred from all of the scraps. It’s not that I was clumsy or uncoordinated, but rather, I played with passion. Baseball was my best sport. I played third base. Making a diving catch was the highlight reel that played over and over in my mind…and sometimes, it really happened! Even now, in my forties, I play softball. I feel like I played my best when I can slide. Oh, and just in case you are wondering, I always slide head first. I have more fun that way. =-) In fact, I need to wear pants (as opposed to shorts) so that when I do slide, the wounds are much less severe. 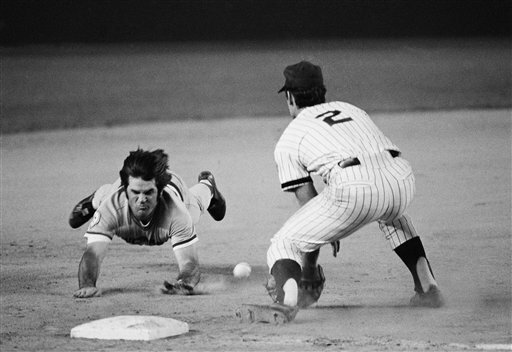 The picture is Pete Rose, not me. The other kind of falling down is the kind that is not so fun. In baseball, sometimes you strike out. In soccer, sometimes the other guy gets past you. Maybe you didn’t get that promotion for which you were hoping. It might have been the harsh words you had with your spouse. Or, if things are really bad, you lose a job because of some bad choices. The gambling problem eats away your savings account. The affair you thought you never would have has become reality. You fell down. Mistakes were made and you fell down. Now you have a choice. Get up or stay down? If I did not have a personal relationship with the Creator of the universe, I would say that getting up is stupid or useless. Just get another job. Just file bankruptcy. Divorce is so common these days. Move away to another state. Yea…just stay down. But I do have an ongoing relationship with the Almighty God and so I say get up. Yes, I fell down. But I am playing with passion right? So I am going to get up and keep going. Whether you are down because of your own doing or something that has happened to you, make the choice and allow God’s grace to help you back up on your feet. Here is what God’s word says about us when we fall down, “for Christ’s sake, I delight in weaknesses, in insults, in hardships, in persecutions, in difficulties. For when I am weak, then I am strong.” 2 Corinthians 12:10. When we fall, He is right there next to us. He will help you get up. He is ready to brush off the dust. He will give you a pat on the back. He will tell you that He loves you. He will teach you something. He will remind you that His plan for you only works if you get up. Take it from someone who has fallen way too many times to count, getting back up is always the best choice.